Jaguar Stone manufactures granite counter tops for kitchens, vanities, and office desks, limestone and marble floor inlays, and decorative art work. 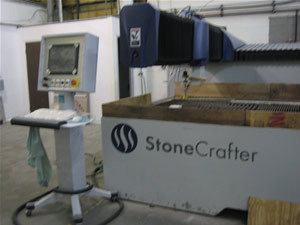 We utilize fully automated CNC edge profiling technology to deliver a variety of edge profiles to appeal to all tastes. Our manufacturing line is computer-based and fully automated. Thus, our cuts are precise and edge profiles are flawless. Using computer-aided design software and computer-based water jet technology to achieve precise design and cutting, we are able to offer an unlimited range of inlay stone designs that employ a rich palette of marble and granite colors and textures. The applications are numerous and include one-of-a-kind counter tops, flooring, dining tables, and art work decorations. Please call or visit our showroom today for additional information and for a free estimate.